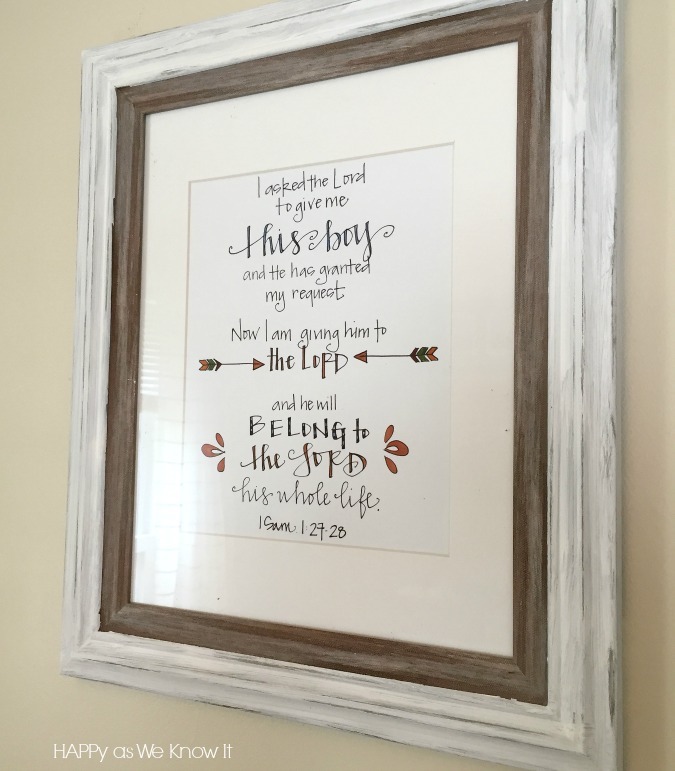 Last week I shared the remodel that was our master bedroom after moving into our new home. If you missed it feel free to visit that post here. 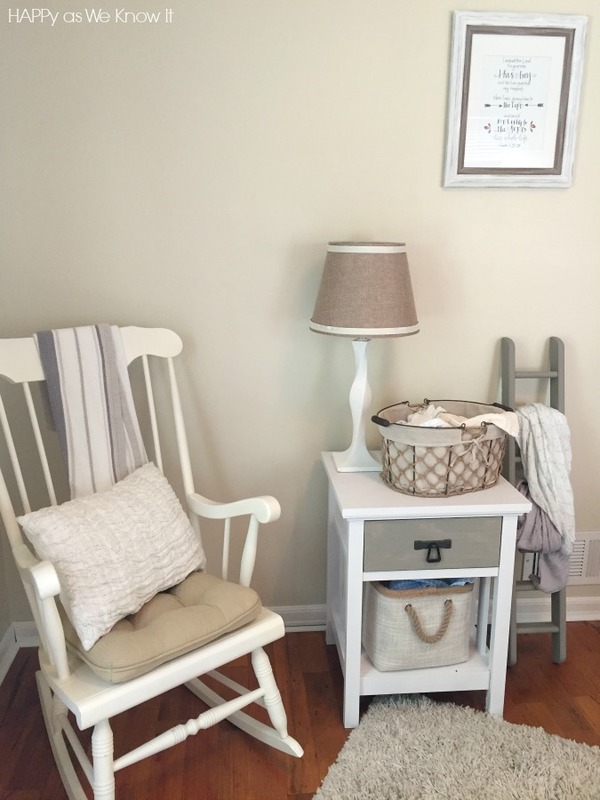 This week, I snagged a few photos of the next room we finished up - our little man's nursery. Lucky for us, this room didn't need much prep work. It was just about the only room in our house without wallpaper (praise the Lord), so all it needed prior to decorating was a fresh coat of paint and we were off. 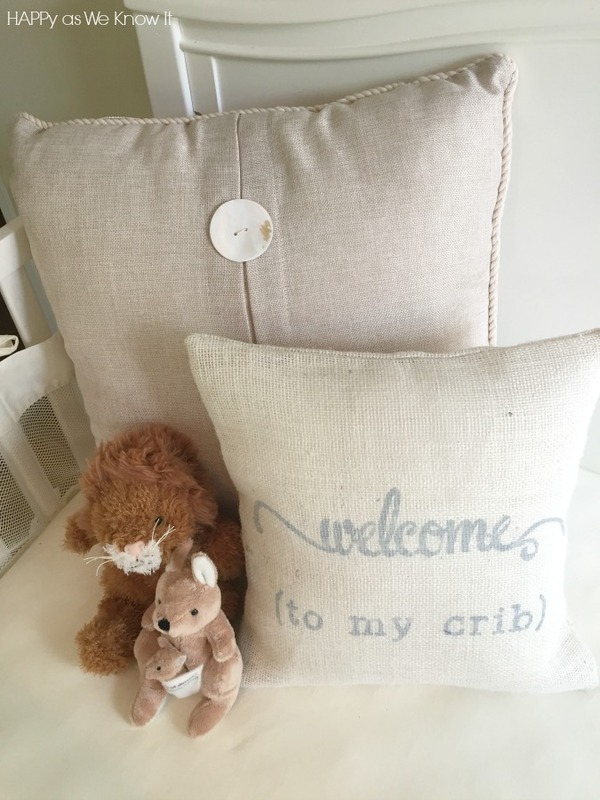 As with the majority of our house, I was all over the neutrals (in color and gender) for little guy's pad. Also, as with nearly everything else in our home, I tried my best to snag free, thrifted, and recycled items, etc. 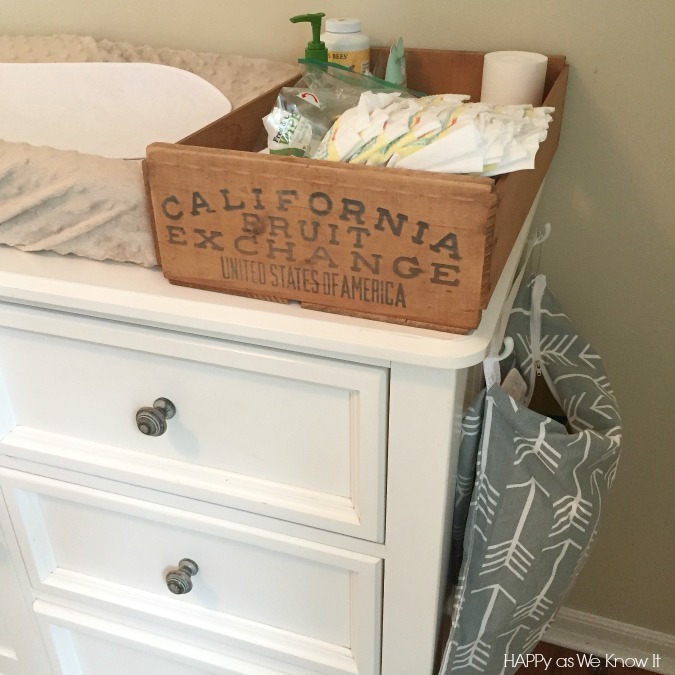 to be as budget savvy as possible in putting the room together. We bought our crib off of Craigslist. 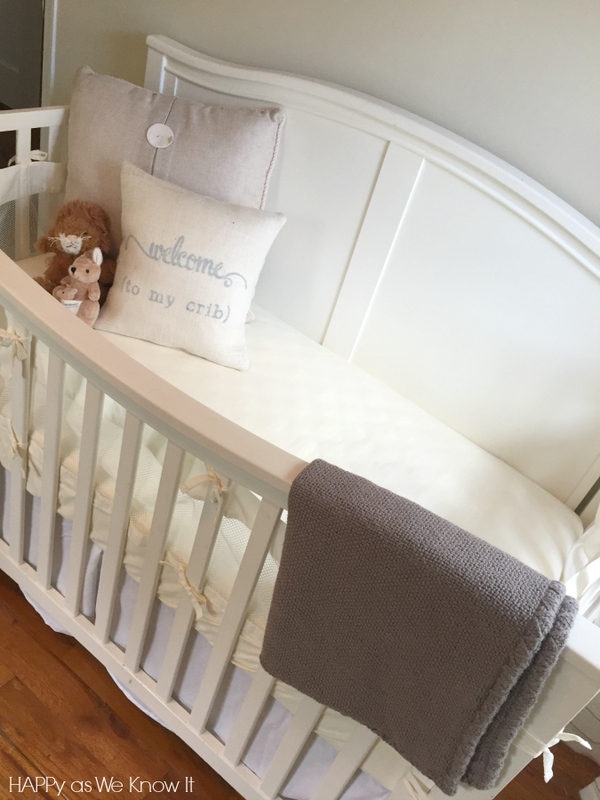 We were able to get a really high quality crib for only $50 as the couple that had used it previously let their little one put stickers all over it. A little elbow grease and a bit of fresh paint and she was back in business! 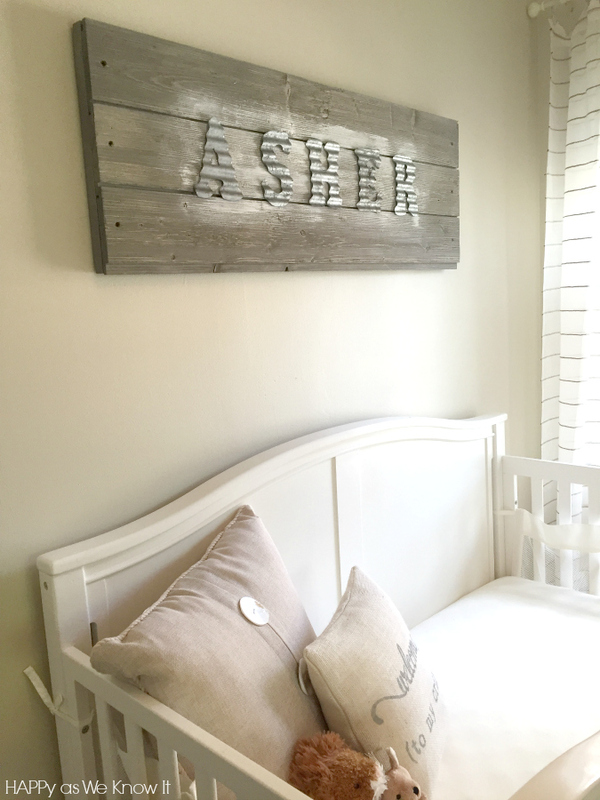 The name sign you see hanging above the crib was actually a joint project between my husband and I. 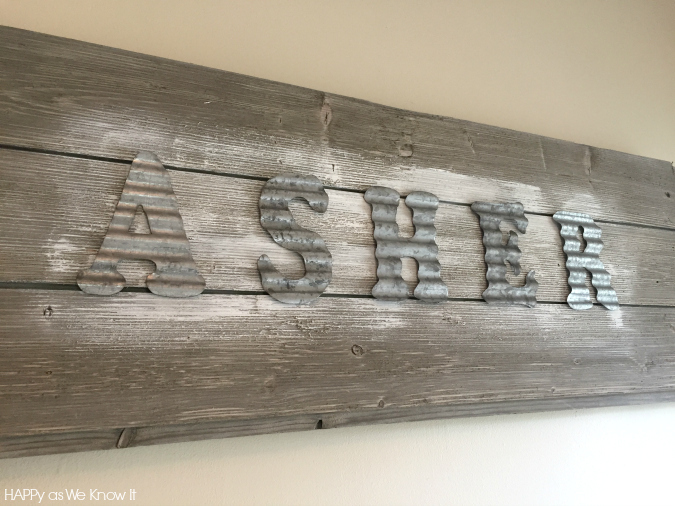 We purchased the barn wood for it at Home Depot, and I picked up the letters for 50% off at Hobby Lobby. He then cut and screwed the wood together, and I took over afterward by adding a touch of white paint for a back splash before hot gluing on the letters. It was incredibly simple and cost us about $20 in all for materials. 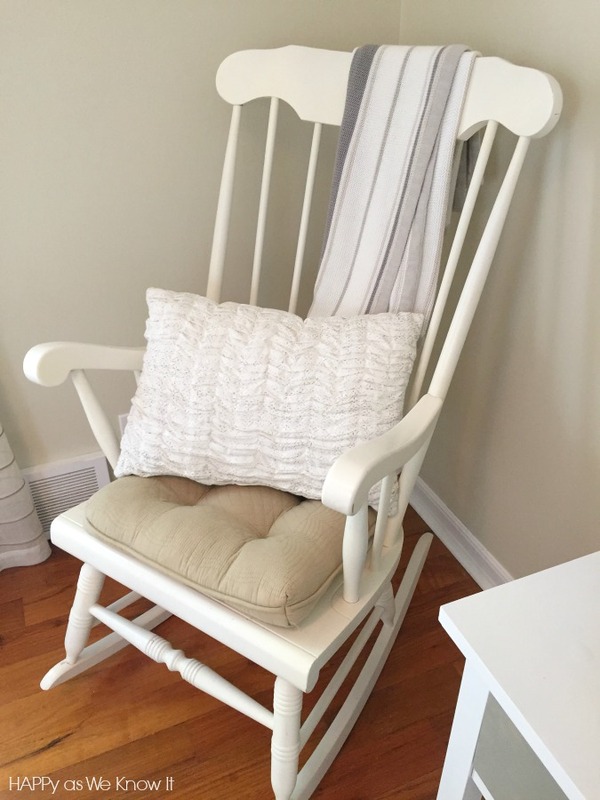 Our rocking chair was also a Craigslist find that I was able to snag from a fellow mom for only $20. I spruced it up a bit with a cushion and pillow that were both purchased at Goodwill for under $10 all together. I don't know about your little ones but our child goes through burp cloths like it's his job. We house them all for easy access in that twine bin you see pictured above that I purchased at Gordmans. 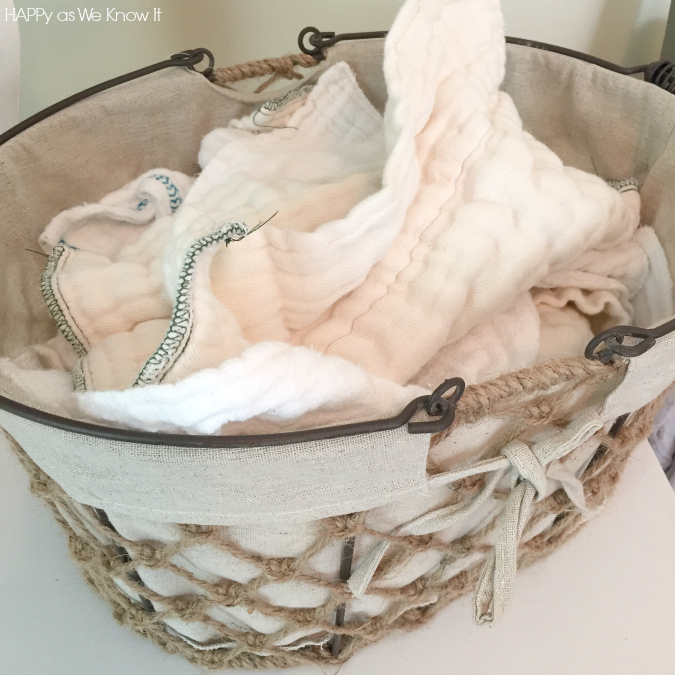 It's pretty incredible how fast we empty that thing - and how much laundry such a little person can create! 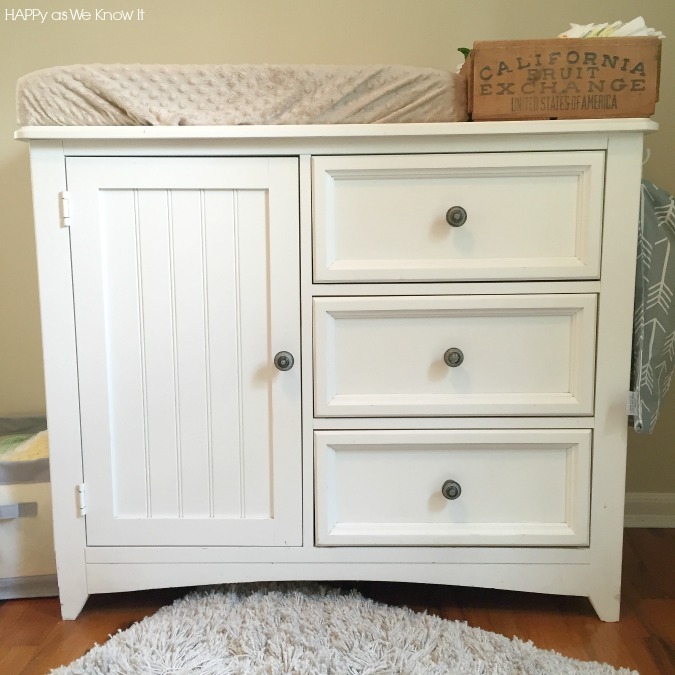 The changing dresser was also a Craigslist find (are you seeing a pattern here? ), that we snagged for only $20. Probably my best steal of the room. It was in great condition, I just wasn't a fan of the originally plain white knobs, so I took them off and purchased the new ones you see pictured at Hobby Lobby for 50% off. 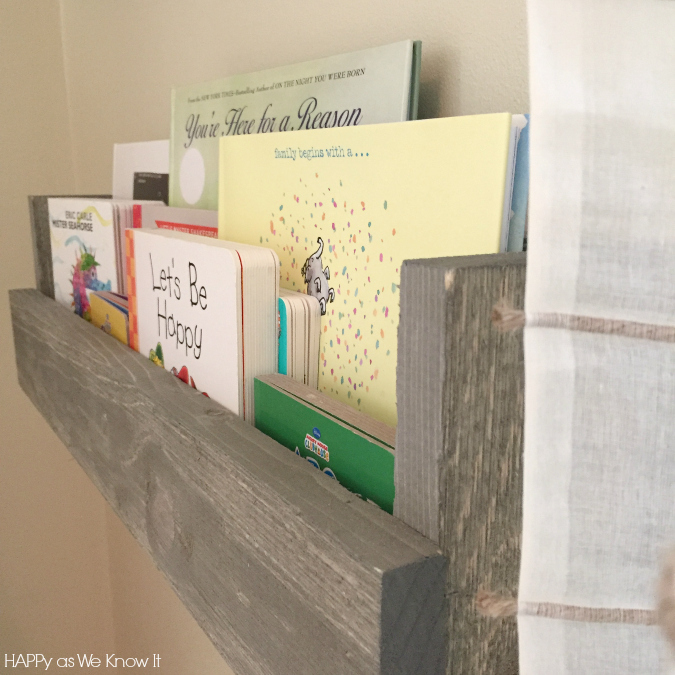 My husband made the bookshelves out of the same barn wood we purchased for the name sign above the crib. 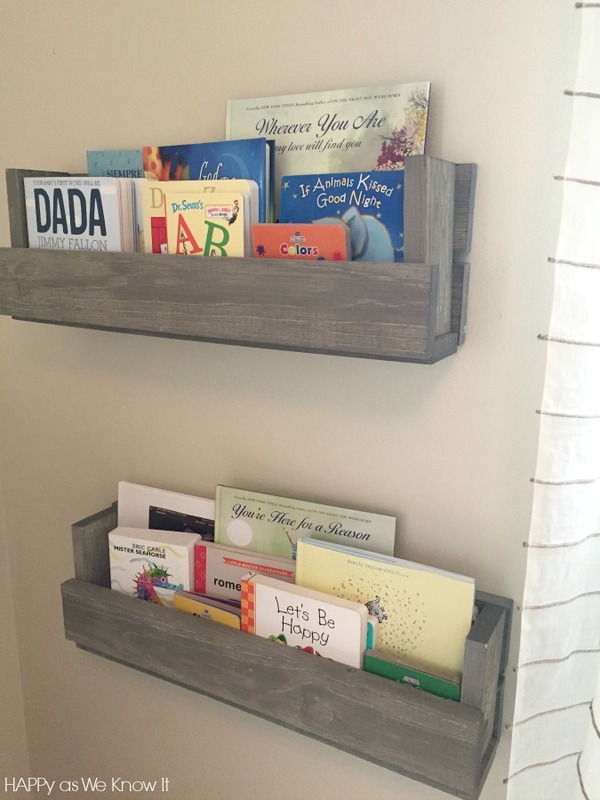 They were so simple to put together (at least for him) and literally took us minutes with a nail gun and only cost us the price of the wood. And there you have it. Hoping our little guy grows to love this space as much as we do, and I am thoroughly looking forward to all the memories to be made here. 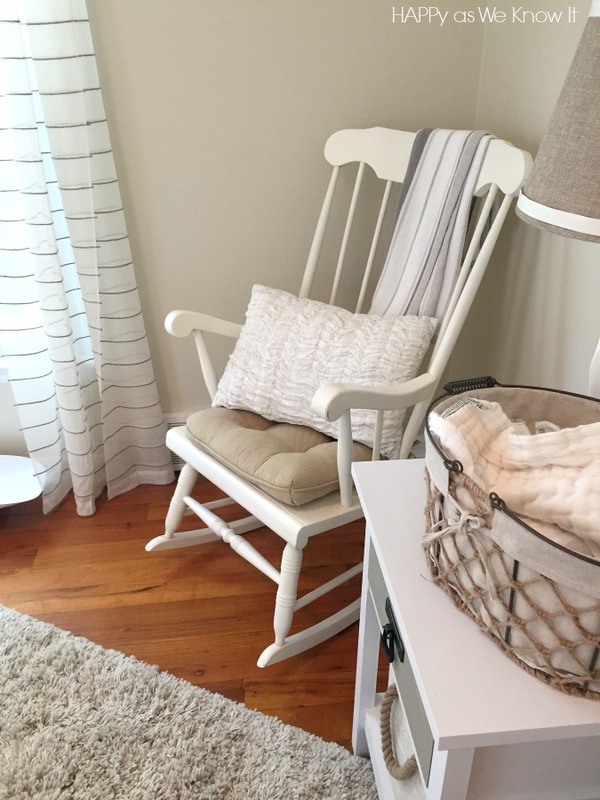 What a peaceful room with great finds!!! 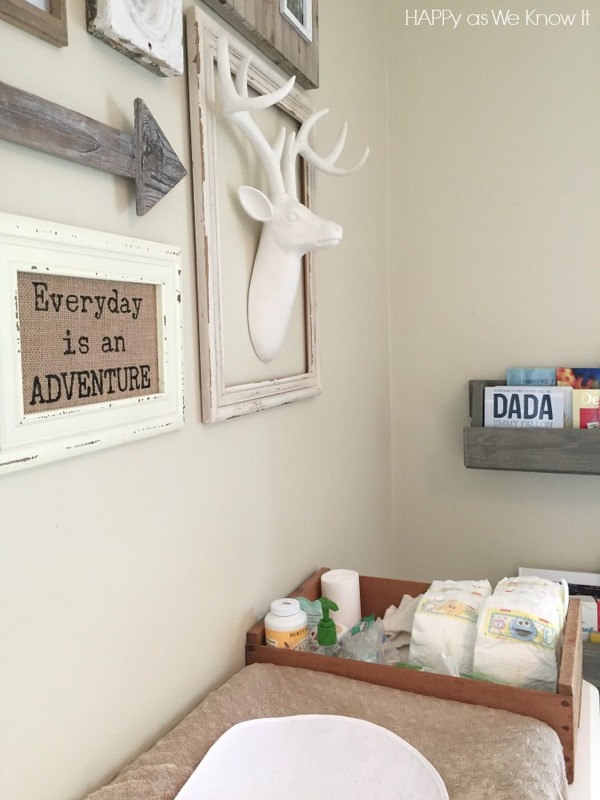 Asher's room is adorable! 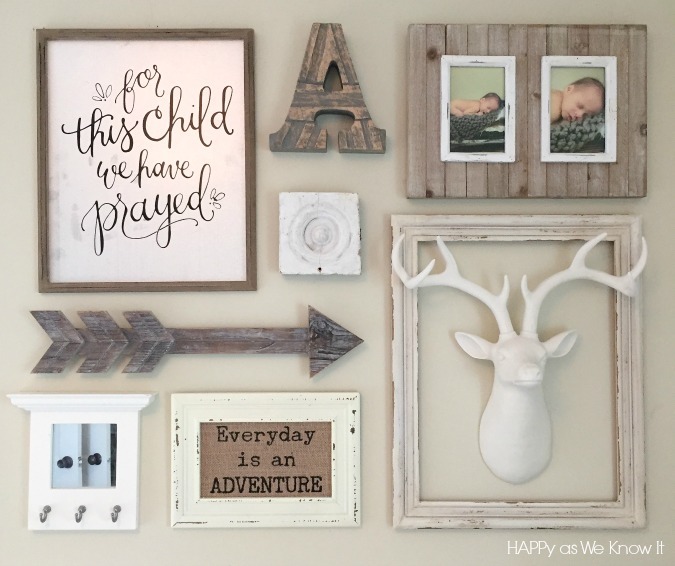 You definitely have some interior decorating skills! Thanks girl! We enjoyed putting it together! It's so beautiful. Could I please ask what the wall paint colour of the nursery is? It's stunning.